Aloha from Hawaii Via Satellite is a concert that was headlined by Elvis Presley, and was broadcast live via satellite on January 14, 1973. The concert took place at the Honolulu International Center (HIC) in Honolulu (now known as the Neal S. Blaisdell Center) and aired in over 40 countries across Asia and Europe (who received the telecast the next day, also in primetime). Despite the satellite innovation, the United States did not air the concert until April 4, 1973 (because the concert took place the same day as Super Bowl VII). Viewing figures have been estimated to be between 1 and 1.5 billion viewers worldwide. The show was the most expensive entertainment special at the time, costing $2.5 million. On July 8, 1972, inspired by a recent visit made by U.S. President Richard Nixon to China a few months earlier, Presley's manager, Colonel Thomas Parker, announced that there would be a worldwide satellite broadcast from Hawaii to allow the whole world the chance to see a Presley concert "since it is impossible for us to play in every major city." Parker initially stated that it would take place in either October or November 1972, but this date was changed to early 1973 after MGM showed concern about it clashing with the release of their documentary film Elvis on Tour. As the show had already been planned prior to this upset, the original shows, now set for November, would still go ahead but without being filmed. Parker held another press conference on September 4, 1972, in Las Vegas to confirm that the concert, now titled Aloha From Hawaii, would be broadcast on January 14, 1973. The press were told that an audience of 1 billion was expected to tune in to see the "first entertainment special to be broadcast live around the world," even though Parker had not taken into account the fact that many countries, including parts of Europe and America, would not see the concert live due to the time of the broadcast. 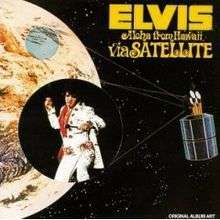 Although the Our World broadcast was the first live, international, satellite television production, which was broadcast worldwide on June 25, 1967, which included entertainment artists such as Maria Callas and headlined by The Beatles) - Aloha From Hawaii was the first live satellite concert to be with a single performer. Two weeks after the Las Vegas press conference Parker received a letter from Honolulu Advertiser columnist Eddie Sherman. Sherman had read in news accounts that there was to be no charge for admittance to the concerts, instead a donation for charity was required. He suggested to Parker that, as Presley had recorded, and was still performing, the song "I'll Remember You," which had been written and composed by Kui Lee, the donations could go to the Kui Lee Cancer Fund that had been set up following the death of the songwriter in 1966. Seeing the chance to publicize Presley's charitable nature once again, Parker eagerly agreed. Producer-director Marty Pasetta had attended one of Presley's concerts at Long Beach in mid-November, and he had found it to be "boring" and lacking in any physical excitement. He approached Parker with ideas about the broadcast, including a runway that led out from the stage so Presley could get closer to his audience. Parker insisted that the ideas were useless, and that Presley would agree that they were useless. Pasetta, however, decided to approach Presley about the ideas anyway and was pleasantly surprised to find that he would be happy to do whatever Pasetta felt was best for the show. This was another example of the ever-growing rift between Presley and his manager. Although Presley would later dismiss Parker, whom he never truly befriended and towards whom he was openly hostile in his later years, the two would reconcile professionally shortly thereafter, and Parker would remain Presley's manager for the rest of the artist's life. Presley performed three shows over November 17 and 18 in Honolulu, the dates originally planned for the satellite broadcast, and gave a press conference on November 20 to promote the satellite special. He also announced officially that it would now be in aid of the Kui Lee Cancer Fund. Presley arrived in Hawaii again on January 9, a day after his 38th birthday, to begin rehearsals. He had lost twenty-five pounds for the show and was confident after news that his record sales were increasing and that Elvis on Tour had been nominated for a Golden Globe. Rehearsals were held at the Hilton Hawaiian Village while the main set was being constructed. Although there were several technical problems, the rehearsals were an overall success. Presley taped a January 12 rehearsal concert as a fail-safe in case anything went wrong with the satellite during the actual broadcast. For both shows, Presley was dressed in a white "American Eagle" jumpsuit designed by Bill Belew. The broadcast was directed by Marty Pasetta, who was then in charge of directing the Oscar ceremonies. Audience tickets for the January 14 concert and its January 12 pre-broadcast rehearsal show carried no price. Each audience member was asked to pay whatever he or she could afford. The performance and concert merchandise sales raised $75,000 for the Kui Lee Cancer Fund in Hawaii. According to Elvis Presley Enterprises, between 1 and 1.5 billion people watched the one-hour broadcast live. Elvis introduces J.D. Sumner & the Stamps Quartet, the Sweet Inspirations, Kathy Westmoreland, members of the TCB Band, and the Joe Guercio Orchestra; and discloses the $75,000 raised for the Kui Lee Cancer Fund. "Long Tall Sally"/"Whole Lotta Shakin' Goin' On"
After the concert was over, Presley returned to the empty arena with the TCB Band after the fans left to record five songs for the U.S. airing of the show, including Gordon Lightfoot's "Early Morning Rain," along with some songs from the movie Blue Hawaii; including "Hawaiian Wedding Song," "No More," "Ku-U-I-Po," and of course the title song. The album containing the music from the concert was a blockbuster hit, becoming Presley's first chart-topping album in the US since the soundtrack to Roustabout in 1965. The original release of the album, however, did not include the five post-show performances. 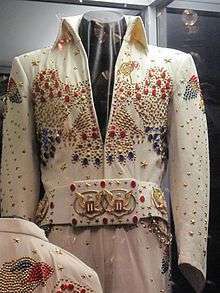 The album would be Presley's final number 1 album during his lifetime. Initially released only in quadraphonic sound, the album was the first quadraphonic album to top the Billboard album chart, and remains the biggest-selling release in the format. Joe Guercio was Elvis's conductor and musical director and, with a few exceptions, the orchestra consisted of local musicians contracted for this particular engagement. The brass players were Patrick Houston, Thomas Porrello, Gary Grant and Forrest Buchtel on trumpet; Leslie Benedict and William Barton on trombone; Martin Harrell on bass trombone; and David Baptist on horn. The saxophonists were Gabriel Baltazar, Jr., Robert Winn, Peter Dovidio, Wayne Dunstan and Mary Taylor, with Baltazar and Taylor also doubling flutes. Violinist Bertine Corimby, who performed with Elvis at the Las Vegas Hilton, headed the 12-piece string section, the rest of whom were musicians from the Honolulu Symphony Orchestra: Dale Bechtel, Marianne Fleece, Louise Solmssen, Arthur Loventhal, Mervin Whitcomb, Heidi McCole and Carol Shive on violin; Betty Deeg and Diana Mallery on viola; and William Konney and Beverly LeBeck on cello. Rounding out the orchestra were Frank Strazzeri on Hammond organ and Dean Appleman on percussion. Houston, Porrello, Harrell and Strazzeri had toured with Elvis in 1972 and were brought to Hawaii for the show, as were Buchtel and Corimby. Harvey Ragsdale was the Hawaiian contractor who hired local musicians for the orchestra. In September 2004, "Aloha from Hawaii" (Special Edition) together with "The '68 Comeback Special" was released on DVD. The 2-Disc deluxe package includes the full-length concert broadcast around the world on January 14, as well as the full rehearsal concert given on January 12, and the extended US version shown on April 4. Additionally, the set contains an uncut 17.5 min. sequence of Elvis arriving in Honolulu and the complete post-concert session. The picture and the sound (in Dolby Digital 5.1) have been digitally remastered from the original master tapes. Early in August 2006 the TV special was also released in a single disc version. This edition contains some new material which was not included in the original deluxe release. The new material consists of some TV news footage shot during the arrival, offering an alternate look on the event and portions of two press conferences held for the upcoming live broadcast in September and November 1972. Those film clips with an overall length of about 9 minutes are so-called "Easter Eggs" and can be found by pressing a hidden button in the menu. A bronze statue of Elvis was unveiled in front of Neal Blaisdell Center Arena in Honolulu. The statue was sponsored by TV Land channel. 1 2 3 "The Story of the Aloha Special IV". ElvisinHawaii.com. Archived from the original on July 25, 2011. Retrieved August 18, 2011. ↑ Guralnick (1999), p. 477. 1 2 Guralnick/Jorgensen, Elvis: Day by Day, p. 310. 1 2 3 4 Guralnick/Jorgensen, Elvis: Day by Day, p. 312. 1 2 3 4 Guralnick/Jorgensen, Elvis: Day by Day, p. 316. 1 2 3 Guralnick (1999), p. 478. 1 2 3 4 Guralnick (1999), p. 479. ↑ Guralnick/Jorgensen, Elvis: Day by Day, p. 319. 1 2 Guralnick (1999), p. 481. 1 2 Guralnick (1999), p. 482. ↑ Fessier, Bruce. USA Today, May 10, 2013,"Director remembers landmark Elvis Presley performance". Accessed May 26, 2014. 1 2 Priddle, Mel. "Presley, Elvis/How many musicians? ", AllExperts, May 15, 2007. Retrieved December 23, 2011. ↑ Penalty of Leadership team. "Aloha from Hawaii, session info". Retrieved December 24, 2011. ↑ American Federation of Musicians; American Federation of Television and Radio Artists. "Recording Artist Royalties, album ALOHA FROM HAWAII VIA SATELLITE", AFM and AFTRA Fund. Retrieved December 23, 2011. ↑ Aloha from Hawaii was released on DVD for the first time in 2000. ↑ "The ARIA Report (Issue 755)" (PDF). Australian Recording Industry Association. Pandora Archive. p. 22. Retrieved August 18, 2011. ↑ "Austria Top 40 – Musik-DVD Top 10" (ASP). Austrian Charts (in German). Hung Medien. Retrieved August 18, 2011. ↑ "Ultratop 10 Muziek-DVD" (ASP). Ultratop (in Dutch). Hung Medien. Retrieved August 18, 2011. ↑ "Ultratop 10 Musicaux" (ASP). Ultratop (in French). Hung Medien. Retrieved August 18, 2011. ↑ "Top 20 DVD, Week Ending July 22, 2004" (JSP). GfK Chart-Track. Retrieved August 18, 2011. ↑ "Artist Ranking DVD". Oricon Style (in Japanese). Retrieved August 18, 2011. ↑ "GfK Dutch DVD Music Top 30" (ASP). Dutch Charts (in Dutch). Hung Medien. Retrieved August 18, 2011. ↑ "Top 10 Music DVDs" (ASP). Recording Industry Association of New Zealand. Retrieved August 18, 2011. ↑ "Topp 10 DVD Audio: 2004 – Uke 29". VG-lista (in Norwegian). Retrieved August 18, 2011. ↑ "Top 20 DVD Musical: Semana 29, 2004" (PDF). Productores de Música de España (in Spanish). Retrieved August 18, 2011. ↑ "Sverigetopplistan". Sverigetopplistan (in Swedish). Archived from the original on March 11, 2009. Search for Elvis Presley and click Sök. ↑ "Archivio: DVD Musicali: Settimana 32, 2006" [Archive: Music DVDs: Week 32, 2006] (PHP). Federation of the Italian Music Industry (in Italian). Retrieved August 18, 2011. ↑ "ARIA Charts – Accreditations – 2006 DVDs". Australian Recording Industry Association. ↑ "Canadian video certifications – Elvis Presley – Elvis Aloha from Hawaii". Music Canada. ↑ "French video certifications – Elvis Presley – Aloha from Hawaii" (in French). Syndicat National de l'Édition Phonographique.